They could become the nation's first Muslim-American women in Congress. And now, Saad hopes to become the nation’s first Muslim-American congresswoman. 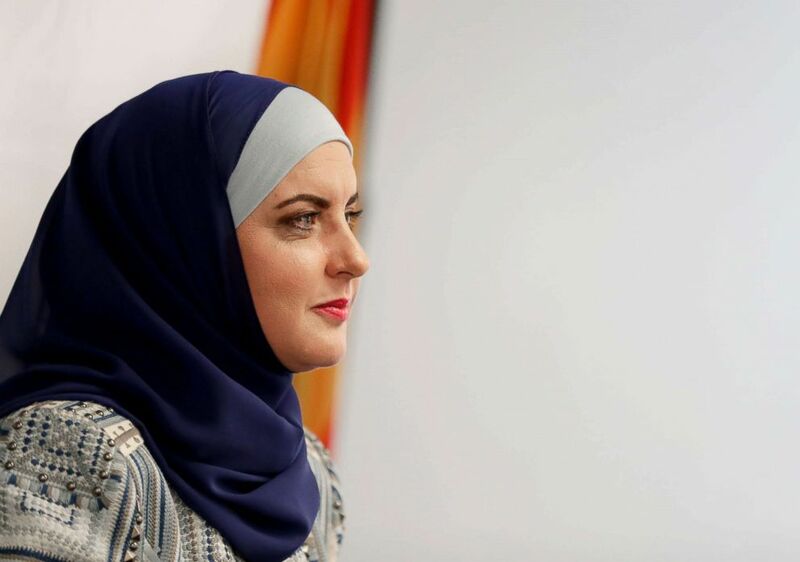 Running in Michigan’s 11th Congressional District, she’s one of more than 90 Muslim-Americans competing in federal, state, and local races this year -- a record number for a group seeking to increase its political involvement in the age of President Donald Trump. “It’s the first time in my life the American Dream is being threatened,” Saad, who's hoping to replace retiring GOP Rep. Dave Trott, told ABC News. (Jim West via ZUMA Wire) Women pick up literature at a "My Muslim Vote" rally in Dearborn, Mich., July 29, 2018. This past Sunday, she attended the ‘My Muslim Vote’ rally in Dearborn along with Alexandria Ocasio-Cortez, gubernatorial candidate Abdul El-Sayed, and Rashida Tlaib, who’s running in Michigan’s 13th Congressional District. Tlaib and Saad will face their Democratic opponents in Tuesday’s primary and seek to spread a message of hope. “When you see a Palestinian person with your name and faith succeed, it shows [the government] can ban us from coming into the country but not from getting elected. Showing people it can be done would be a victory to my family,” Tlaib, who's running to replace former Democratic Rep. John Conyers, said. Tlaib and Saad are just two of a handful of Muslim-American women running for office this year -- a group that includes Ilhan Omar, Tahirah Amatul-Wadud, and Deedra Abboud. Some observers believe Tlaib, a former state representative, is slated to win her primary on Tuesday. But she's in a crowded field of candidates. "At a time when women, American Muslims and immigrants are under attack, the historic elections of Rashida Tlaib and Ilhan Omar are especially important. 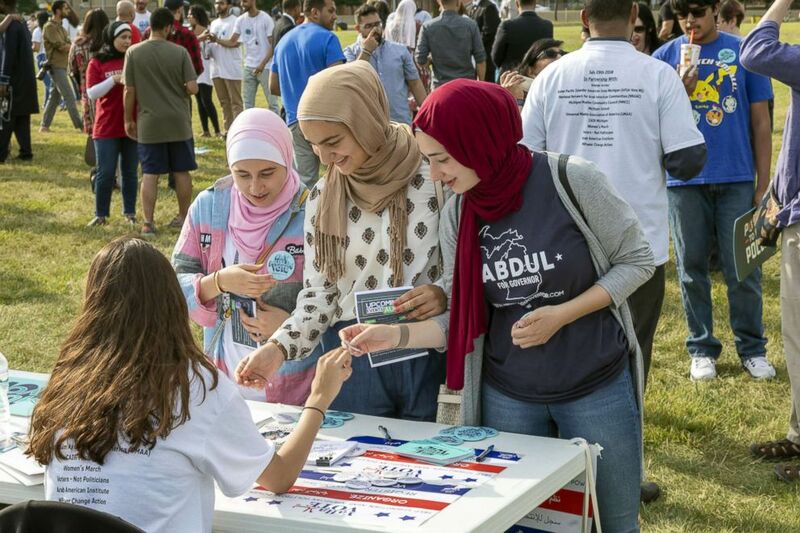 While Rashida and Ilhan will represent everyone in their districts, they will also be seen by other American Muslim women and women of color as symbols of possibility in our democracy," said Sayu Bhojwani, founder and president of New American Leaders, a group that helps first- and second-generation Americans get elected. In 2016, Omar made history by being elected as the nation's first Somali-American legislator. Now, she’s hoping to succeed Democratic Rep. Keith Ellison -- the first Muslim elected to Congress -- in Minnesota’s 5th Congressional District. (Matt York/AP, FILE) Deedra Abboud announces her candidacy for U.S. Senate, July 31, 2017, at the Democratic headquarters in Phoenix. Abboud, who’s running to replace GOP Sen. Jeff Flake in Arizona, told ABC News if elected she’d be the first Muslim-American "ever in the Senate, and the first to wear a scarf." But on August 28, Abboud will face Rep. Kyrsten Sinema, whom observers say is poised to win the Democratic nomination. “Muslims traditionally go in and out of politics, but mostly out. They’re not as active as a demographic but when they see people who they can identify with they feel like this is part of them and they can participate,” she said. Last year, Abboud received disturbing messages online targeting her faith, leading Flake to defend her on Twitter. “There’s definitely been an evolution since then. At first, people thought I was running to make a point and that I wasn’t serious. But now they know I have common-sense approaches to issues and can talk policy,” she said. “I’m running to be a voice for the voiceless and marginalized,” she told ABC News. Amatul-Wadud is running to unseat Democratic Rep. Richard Neal. Tlaib and Saad said they haven’t received much negative attention within their districts for their religion, though they say most of the hatred comes via social media. “It’s not much of an issue in my district. My style is more attacked than my faith or ethnicity. But that being said, I have received hate mail and social media attacks across the country accusing me of promoting Sharia law,” Tlaib said. “But there have been social media trolls promoting messages of discouragement,” she said. 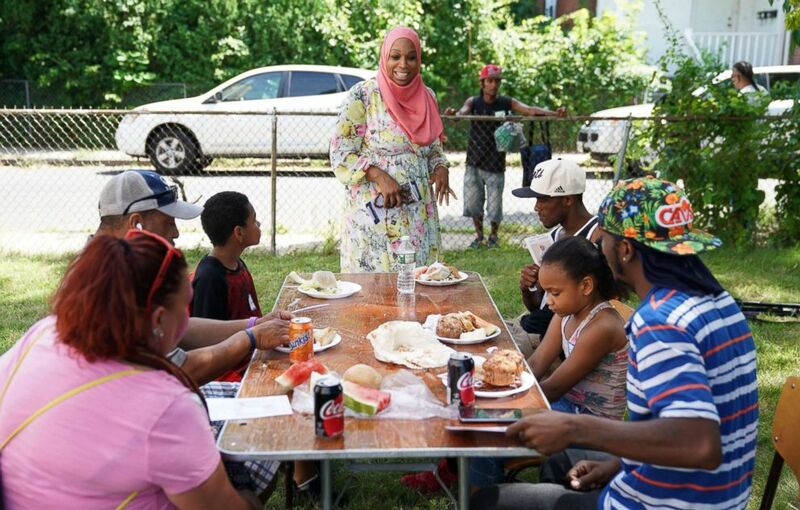 (AFP/Getty Images, FILE) Tahirah Amatul-Wadud, who is running in the Democratic primary for U.S. Congress in Massachusetts, meets with people at a Mt. Zion Church event in Chicopee, Mass., July 21, 2018. Ultimately, these women hope to inspire voters both within and beyond their religious communities. “We’ve attended iftar dinners during Ramadan and knocked on doors in the same way we’d visit churches. We’re never taking any voters for granted,” Saad said. Furthermore, they believe their progressive politics come first. “More than anything, I’m running as a progressive and trying to get people back on the message,” Saad said. Meanwhile, Tlaib noted the importance of representation that reflects the people. “The Democratic establishment told me to wait my turn. But there’s currently no moral compass in Congress. I want to show that people can win over money and the establishment,” she said. To Bhojwani, these women's candidacies demonstrate that "legislatures are truly reflective of our population, signals to other American Muslims that they too can run and win, and sends the message that any district in America can be represented by anyone -- not just old white men." Because, in the end, each woman believes the issues are what matter most. “When you knock on doors, no one asks you about your religion. People ask about fixing health care and immigration,” Saad said.